The Institute for Learning in Retirement Inc, a non-profit lifelong learning program offering classes to the community for over 20 years, has announced a very special speaker will be featured at their program on Thursday October 4, 2018. Retired Supreme Court Justice John Paul Stevens will be joined by Palm Beach Post columnist Frank Cerabino for an up close and personal conversation. The program will be held at the Unitarian Universalist Fellowship of Boca Raton (2601 St Andrews Blvd Boca Raton FL 33434) at 2PM. Justice Stevens served as an Associate Justice of the Supreme Court of the United States from 1975 until his retirement in 2010. In 1970, President Nixon appointed Justice Stevens to the U.S. Court of Appeals for the Seventh Circuit. As an appellate judge, Justice Stevens established himself as an expert legal thinker. Five years later, he was elevated to Supreme Court when Justice William Douglas stepped down. Although appointed by a republican, over time Justice Stevens emerged as a leader for the Court’s liberal wing. 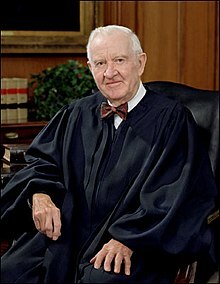 When Justice Stevens retired on June 29, 2010 at age 90 he was the third-longest serving Justice in the Court’s history. Since retiring he has written two books, Six Amendments: How and Why We Should Change the Constitution, and Five Chiefs: a Supreme Court Memoir. In 2014, Justice Stevens testified before a Senate Committee to criticize recent Supreme Court decisions that weakened spending limits in political campaigns. Even in retirement, Justice Stevens remains an active participant in the formation of Supreme Court decisions. Admission to this special event is just $25.00 with all proceeds supporting ILIR programming. Tickets will be available at the door but to avoid disappointment, participants are urged to make an advance reservation by mailing a check to: ILIR, 21346 St Andrews Blvd Ste 142 Boca Raton FL 33433. For further information, contact the ILIR at 561.883.0999 or via email at ILIRincInfo@att.net.